^ Quickfacts.census.gov - Schoharie County - accessed 2011-12-06. 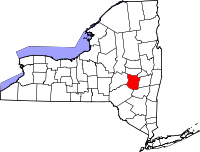 ^ American FactFinder - Schoharie, New York - accessed 2011-12-06. ^ American FactFinder - Cobleskill, New York - accessed 2011-12-06. ^ Jumping in Pools: History of Schoharie. Jumpinginpools.blogspot.com (2009-02-17). Retrieved on 2013-08-16.